It’s hard to describe the feeling when I first stood in front of an elephant…Not because I felt scared or threatened but because I have never felt such admiration for an animal before. I reach out as her long, floating trunk came to meet my hand with amazing accuracy. Her nose is wet and cold and I can hear her sniffing my palm for treats. Her waving, cloth-like ears are a sign she’s happy. I smile at her as she takes a piece of watermelon from my hand, rolls it up in her trunk and passes it into her mouth with ease. Her name is Saza, she is 70 years-old and one of the most beautiful creatures I’ve ever met. Just simply being near to her, I feel such a connection to this gentle giant. Saza’s thick skin is dotted with long black hairs and feels rough to the touch. It is like running my hand over a damp, wrinkled piece of sandpaper. She has spent most of the day covering herself with dirt so her grey tone had turned more of a coffee-like blend of yellow and brown. It was November 2016 and I was volunteering at the Elephant Nature Park sanctuary in Northern Thailand, a now world famous rescue and rehabilitation centre for elephants, cats and dogs. I had chosen to go to Elephant Nature Park right at the end of a 13-month backpacking adventure. I didn’t yet know that week would completely change my perspective on life and humble me beyond words. Feeding and bathing times were the happiest, the moments when I saw that the elephants still trusted humans despite their ordeals. Bathing one happy elephant (thanks to the basket of fresh watermelon). Preparing fruit and harvesting corn were the times where I saw the connection between the volunteers and just how much we all wanted to help care for the elephants. It was the laughter, the days of hard work and the beautiful people I met at Elephant Nature Park that made it the week that it was. The week that made me realise I love people just as much as I love animals. 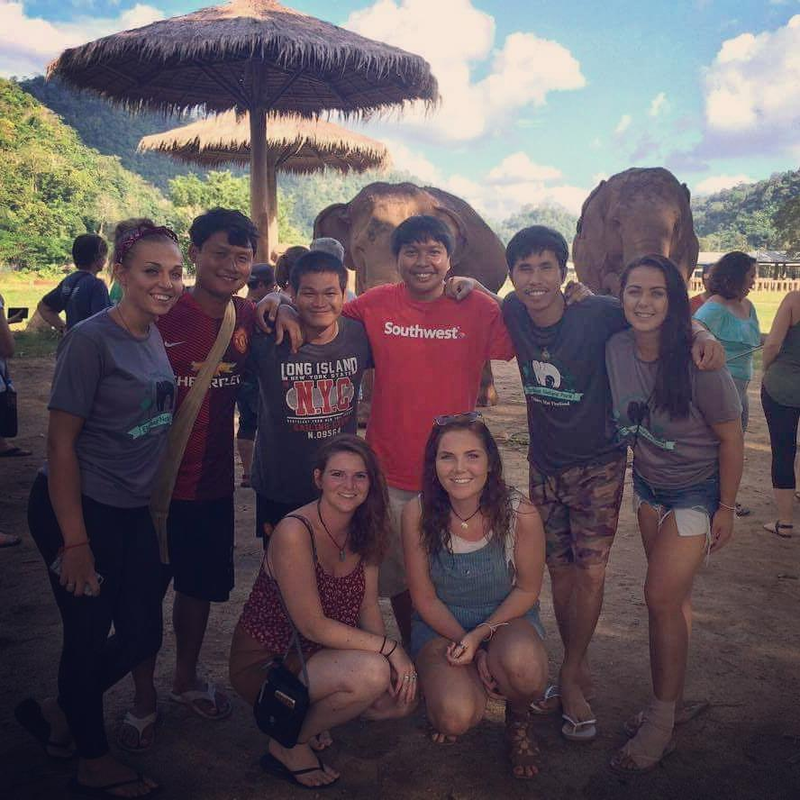 Me (bottom left) with friends Elena, Hannah and Katie and our four volunteer leaders at Elephant Nature Park (middle). I came to learn of the horrific abuse that the majority of the elephants there had suffered for most of their lives. The abuse and neglect being why they could no longer be returned to the wild. Some were either partially or completely blind, some had scars and some simply were too nervous to be around anyone other than their mahout (their keeper). It broke my heart to hear how some elephants had been blinded by sling shots or had broken bones due to forced riding or logging work. One had even lost half of her foot from stepping on a landmine while working. “How could anyone treat these magnificent creatures this way?” I asked myself repeatedly. Each day that I was lucky enough to touch one of the elephants, I looked up at them in complete awe. Their sheer size emphasised to me just how powerful nature can be and gave me an appreciation of my place in the natural world. I hoped they knew that no one would ever hurt them again. The elephants adored corn in huge quantities! The magic behind this place exists because of one woman. One woman who has been rescuing elephants across Thailand for more than 25 years. Her name is Sangdeaun “Lek” Chailert, founder of Elephant Nature Park and Save Elephant Foundation. I was lucky enough to meet her, chat to her about her amazing work. I also sat in on one of her talks. According to Lek, her efforts have meant she has previously received threats and given a bad reputation in some areas of Thailand. But she hasn’t let this stop her. Today, Lek relies on the hundreds of Elephant Nature Park volunteers to help spread awareness of elephant suffering all over the world. 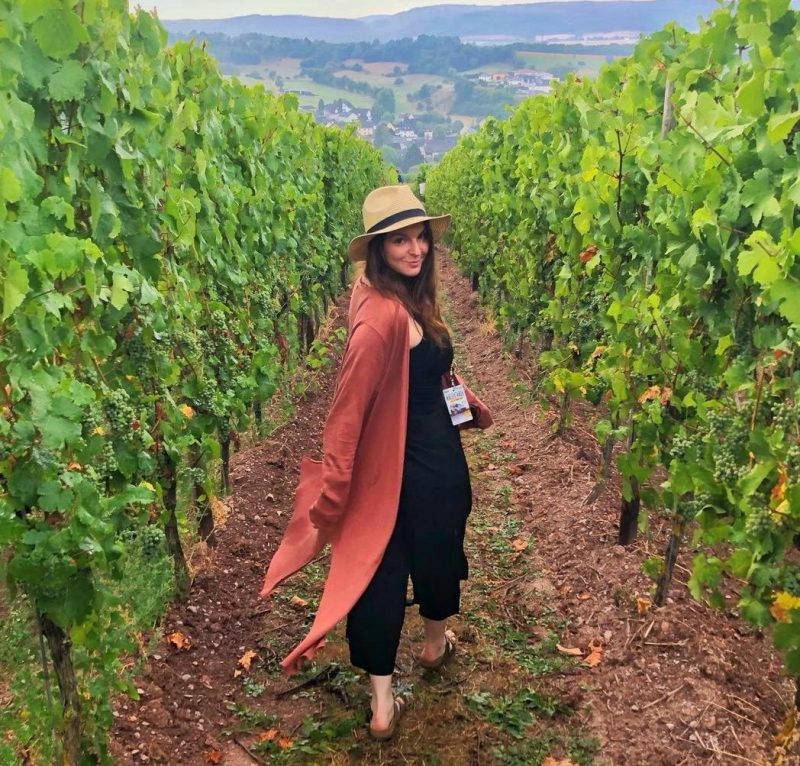 She believes that social media and word of mouth can help stamp out the abuse of elephants in the tourism industries. “You have the most powerful tool in your hands…It is social media. Use social media to go and spread the word,” she urged. Lek (right) spending quality ‘mud bath’ time with the elephants. “I love it when I see their suffering come out and they become playful,” she said. Although Lek has now rescued over 70 elephants, the park is still surrounded by camps that promote and sell elephant rides. Behind the scenes, it is commonplace in these camps for calves to be separated from their mothers and nannies so they can be easily trained for riding, performing or street begging. Lek explains that the female elephants at Elephant Nature Park still have a natural instinct to care for these calves. “Today you might have seen that one of our elephants tried to cross the river because they are training baby elephants in the camp up there. The babies suffer without their mother,” she said. “Our female elephants here are very upset,” she added. For me, as someone who fully supports Lek and the stoppage of elephant tourism, this was a heart wrenching reminder that more work still needs to be done. But for now and as one person trying to help, I am just grateful that people like Lek and her team at Elephant Nature Park exist. If it wasn’t for them, many of the rescued elephants wouldn’t have survived. I am still grateful, three months on, that volunteer opportunities like this are available and I was lucky enough to experience it. An amazing group of people. 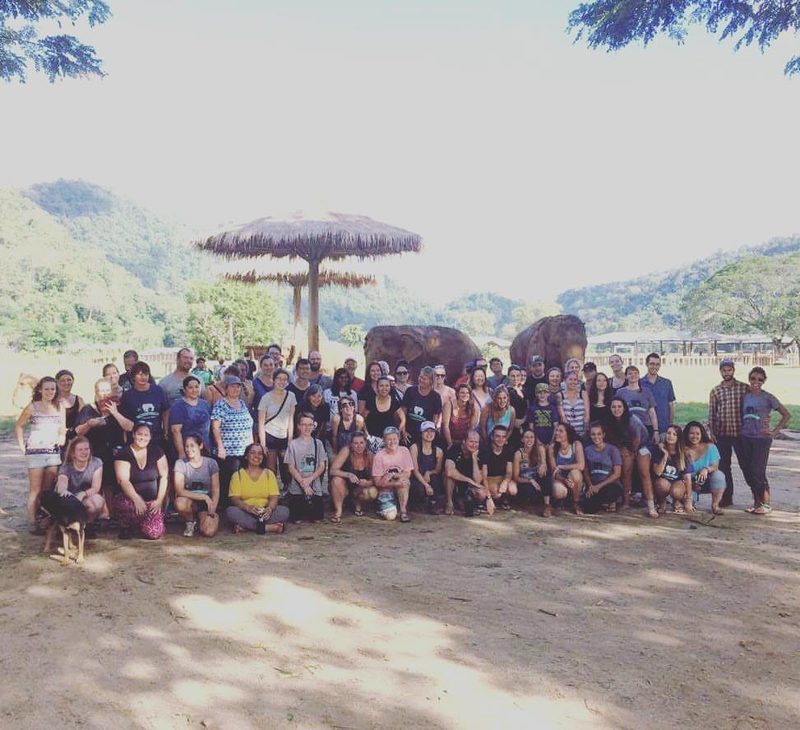 The Elephant Nature Park volunteers, 7th – 13th November 2016. I came out of that park a changed person. As our herd of minibuses rumbled down the dirt road back towards Chiang Mai, I took one last glance back. Every penny had been worth it. I would miss seeing the animals everyday, waking up at sunrise to the sound of elephant calls and being part of something amazing. I’ll be back one day. Until then, I can take comfort knowing it was the best decision I made on my entire trip. My one-week volunteering placement cost me 12,000 Thai Baht (THB) which converts into roughly £270 (January 2017). This price included three meals each day and shared accommodation at the park. Take a look at the Elephant Nature Park‘s website for volunteering details and pricing here. It is one of the best and most rewarding things I’ve ever done! I couldn’t recommend it more. They are introducing a ‘no touch’ policy for the elephants now as they are trying to let the elephants have as much of a natural life as possible – I think it’s great! This looks wonderful! I would definitely volunteer here if I find myself back in Thailand! So true about social media being important to enact change, let’s hope more people are like the wonderful Lek! It was (and still is) such an amazing place – I would recommend it to anyone. I hope the world can learn something from all of Lek’s hard work and determination – she is a true legend.